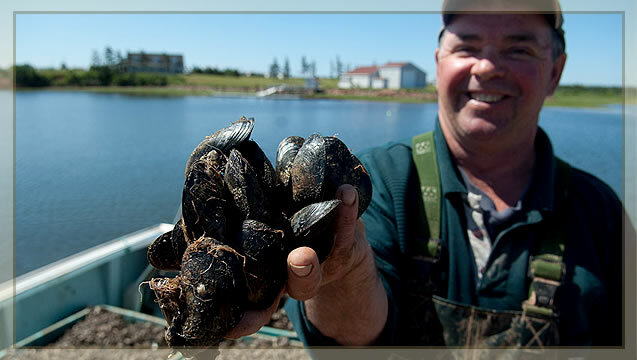 Island Gold cultured blue mussels are 100 per cent rope grown in the bays and inlets surrounding Prince Edward Island. 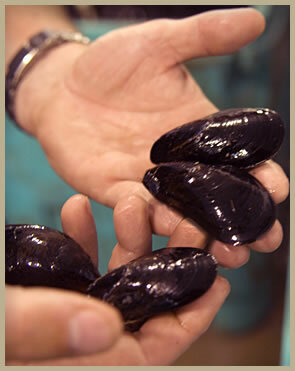 Cultured blue mussels differ from wild or partially cultured blue mussels because they spend their entire life span suspended in the water column never touching the bottom or having the opportunity to pick up sand or grit. Being grown off the bottom also allows for better access to the suspended food particles mussels filter from the water, resulting in fast growth and high meat yields. The result is a fuller mussel; its appearance is a clean, shiny bluish-black shell, thus making it more attractive for serving right in the shell. Prince Edward Aqua Farms rope grown blue mussels are monitored and nurtured each day throughout the entire life-span up until the day they are harvested. Over the course of 18 to 24 months, from seed to full development, our crews check each line and growing sock by hand to assure the crop is growing at its best. By harvesting mussels using boats in the summer months, and through ice harvesting in the winter, Prince Edward Aqua Farms supplies the freshest mussels year-round. The result of such attentive care is all in the taste! Island Gold blue mussels harvested from the bays of Prince Edward Island are flavourful, plump, and delicious - but don’t just take our word for it, try them for yourself. Mussels contain higher levels of Omega-3 fatty acids than any other shellfish.